In active operation for just over a year, the inspection and certification body Cosmecert has just announced that it has reached two important milestones in its development at the end of 2018: it has obtained the dual accreditation COSMOS-Standard and ISO 17065, and now has 50 client companies. Cosmecert has therefore just announced that it has completed these two steps at the end of 2018. In April 2018, Cosmecert was audited by International Organic and Sustainable Accreditation - IOAS. 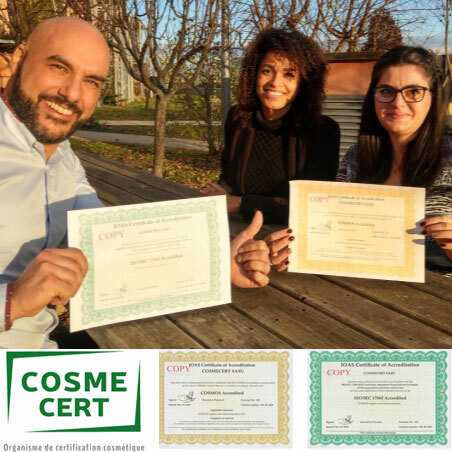 At the end of November, the company received its accreditation certificate, becoming the first French certification body accredited by COSMOS. This dual accreditation guarantees the quality of the certification work, and in particular the impartiality and independence of the decisions taken by Cosmecert. It also attests to the respect of procedures and the competence of the staff. 50 customers trust Cosmecert to certify their finished products, raw materials and production sites according to the COSMOS standard. A result that exceeds the initial objectives and consolidates the development of the structure.